The Gold Coast is a mecca for aquatic adventures and you can now gift some of its awesome experiences! Purchase a voucher for either the half day dolphin and Stradbroke Island kayaking tour or the sunset twilight tour online and make someone's day for their upcoming special occasion. On these journeys, they'll have the chance to spot dolphins, turtles, stingrays and more in the wild - how awesome?! Catering to any fitness level, these tours are designed with people of all skill and confidence ranges in mind, and you will be given comprehensive instructions on how to use both the kayaks themselves as well as the snorkelling equipment. 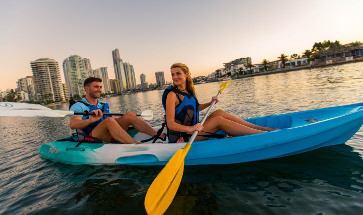 A great gift for the active person with a paddle across the tranquil waters of the Gold Coast Broadwater while keeping an eye out for dolphins & turtles. 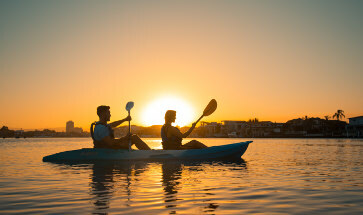 Give a relaxing paddle at sunset past the beautiful homes of the rich and famous on the Gold Coast. Purchase a gift voucher here.